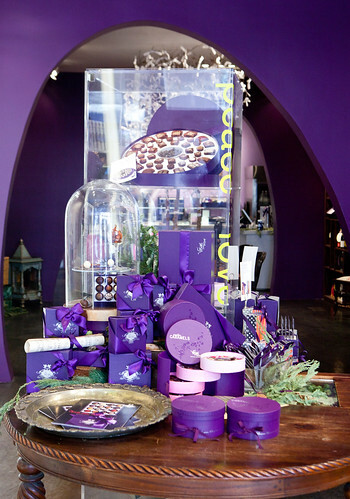 When I visited Chicago, I had to visit Vosges Haut Chocolat mostly because this company is started and based there. 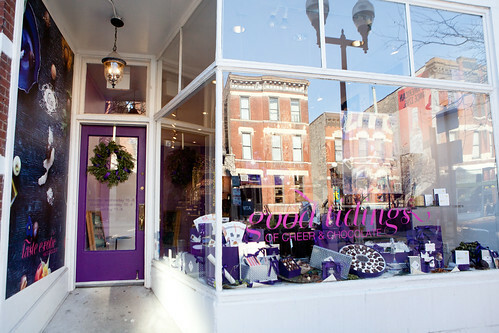 I came with a friend to their Lincoln Park, which is considered Vosges’ flagship. 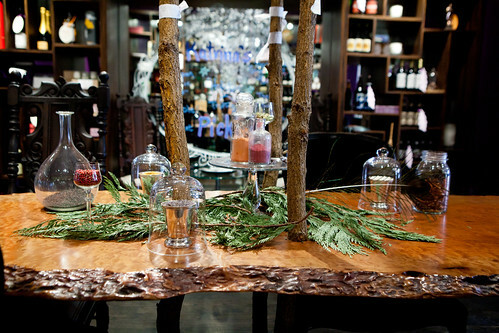 It is much larger shop than the one and looks more of a glamorous romantic than the darker, bohemian chic than New York’s SoHo boutique. I find it quite interesting that each store has its own personality rather than having a “cookie cutter” template of how each store should look like. 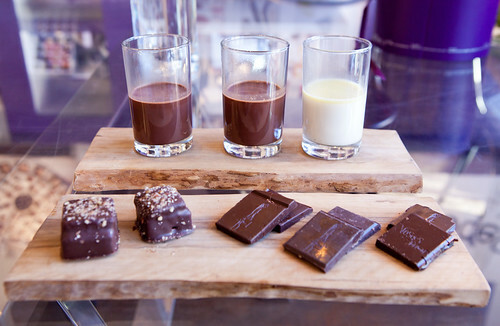 We ended up tasting a few chocolates and hot chocolates, despite the fact it was around 10:30 AM. 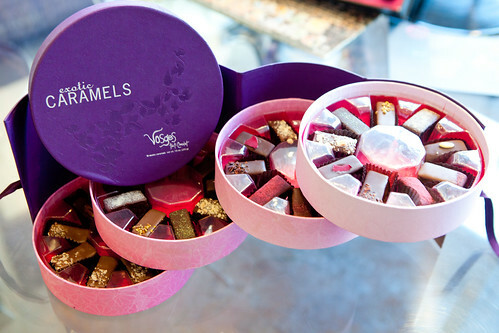 (As a chocoholic, it’s never too early for chocolate.) 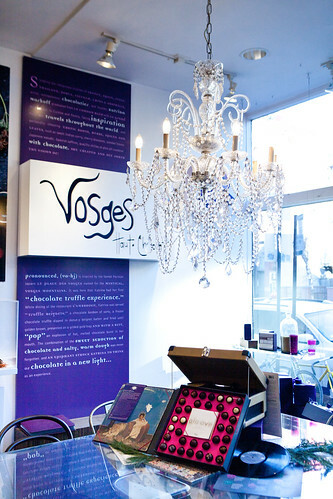 The trio of Vosges’ hot chocolates were delicious, as always. The Aztec Elixir (dark hot chocolate flavored with ancho and chipotle chilies, Ceylon cinnamon and cornmeal was the most appealing and different. The La Parisienne hot chocolate was great for the pure dark chocolate lover and the Bianca was good for the type of person who prefers the white chocolate with a subtle twist of Australian lemon myrtle and lavender. 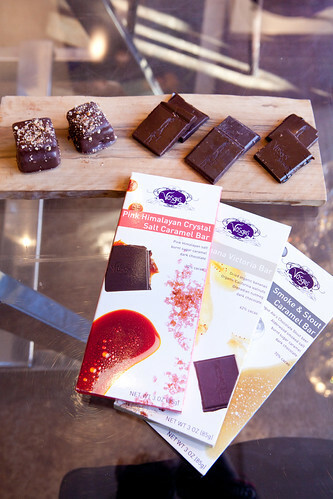 The chocolates we tasted were the caramel marshmallows and their new chocolate bar flavors: Banana Victoria (an intriguing dark chocolate bar studded with banana chips and organic walnuts), Pink Himalayan Salt (a dark chocolate bar filled with a gooey, nicely salted caramel bar), and Smoke & Stout bar (a dark chocolate bar filled with a somewhat runny (in a good way) caramel that’s flavored with chocolate stout beer and smoked salt). 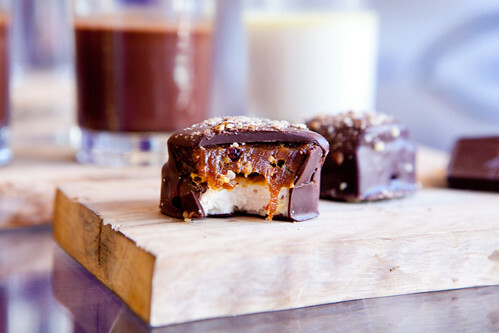 Of the three I do like the caramel filled chocolate bars the most. The Banana Victoria was good but as of recent days, I’m obsessing over well made caramel and those mentioned bars does contain it. Before we left, we’re surprisingly were gifted with goody bags to take with us, containing the same chocolate bars and their caramel marshmallows that we can share with friends at home. 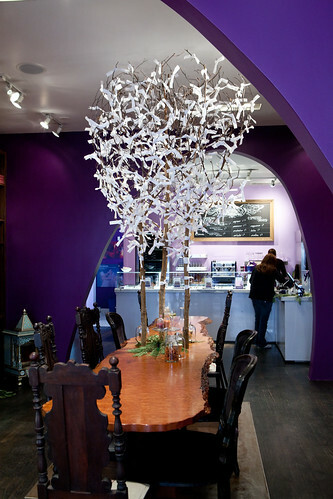 For any person who appreciates creative and delicious chocolates, this is one of the stops I would recommend to drop in. The decor is beautiful and spacious. The staff who works there are very well versed about their products and friendly.